Aetherian Archive (AA) is one of the trials in Craglorn in the game, Elder Scrolls Online. It is the domain of the Mage celestial. For those unfamiliar with the celestials, you can consider them the zodiac spirits of The Elder Scrolls series. There are several times when the mage talks with the raid group during this trial, usually to insult the players who can’t possibly understand anything. Before we worry about the Mage, however, there are a number of obstacles in the way. Let’s start at the first door of this trial. This preparation will help you get on your way. Have somebody designated to run the Rapid Assault skill from the AvA assault skill line. Use it just before entering the first door. Entering the first door starts the “corridor of fire” event. A short run up some stairs and into Fire Atronachs is waiting just for you! There are three fire walls that pop up in order, roasting people. Technically you could work on avoiding them, but there’s really no need to do so. Everyone except the tank should run past the atronachs, then turn around and defeat them. After you survive that, you’ll reach the second door. This time, you will run an ice-themed gauntlet. Here is where Rapid Assault is very important, because the whirls of cold in this hallway will root players in place. By using this skill, you can avoid this being an issue for everyone at one time. At the end, two Frost Atronachs await you. Again, DPS players and healers should run past, then turn to engage the enemies. The final hallway of elemental-based trouble is filled with lightning. Again, use Rapid Assault and just run past them. This time, however, you reach an area that is more open and face a large pack of humanoid foes. The tank should run in, and everyone should kill these foes en masse. Grouping close together will allow the healers to be more effective at using their skills, especially if everyone also maintains enough health not to melt when hit with a little heat. The Lightning Storm Atronach will show up once the players drop down into the lower area and move close enough to the summoning platform. There are two approaches to the fight. The group can either cluster together in front of the boss while running to light beams or bunch up in front of the boss while healing hard. Shocking Blast: A single hit attack against everyone in range. This attack is of minimal threat so long as you are grouped up. Light Beam: The light beam shows up as a safety marker against the storm attack of this boss. You can ignore this if you are trying to heal through the storm. If you are not planning to heal through it, you must run to the marked location to avoid the massive damage that the Harsh Storm ability inflicts to all players. Harsh Storm: The boss unleashes repeated attacks causing massive damage to everyone for about eight seconds. Having an off-healer and using the Nova or Veil skills at this time is important to group survival. Extremely powerful healers may manage without off-healing, but most parties will find it’s more effective to have an extra healer. What does the group reach next? Platforms! This mechanic will show up multiple times in AA. In this section, you need three groups, since the twelve platforms are set up as three distinct groups. Remember that all twelve platforms must be activated for them to work. Each platform should have one member of the designated group on it with the center group crouching for stealth. You can verify that you activated your platform by watching it sink slightly when you step onto it. The left and right groups should kill everything as quickly as possible. When they are done, they should run down to join with the center group. The center group should wait for the all-clear signal from both the left and right side groups. The enemies in the center will keep respawning unless both sides are cleared first. Once the enemies on the two sides are defeated, the center group can engage their foes. After a little fight with some foes, you arrive at yet another set of twelve platforms. Once all of these are activated, the raid group will be ported to the next boss. This boss fight requires coordination, and discussing the methods of dealing with the Chainspinner’s vile circle of harmful chains before engaging it is very useful. Players will once again be grouping on the tank. Adds: New Chainspinners and Nullifiers will be summoned regularly. The Nullifiers are a minor issue at best, but the Chainspinners must be killed as soon as they spawn. Under the boss: Step back slightly so that you are out of the area of effect (AoE) circle, unless another AoE is placed in the group. In the group: The raid group should circle right or left around the boss. Players should move just far enough to get out of the danger spots, then cluster together again. Handling more than two chainspinners when the boss has greater than 20% health: The group isn’t killing chainspinners quickly enough with splash damage and area attacks. Destroy them and then return to attacking the main boss. Pound: The boss slams the ground several times, dealing damage to all members of the group. Healers should be using area heals for this to make the fight far less painful. This ability is not really a threat unless you are not clustered together, although a bugged instance can cause this skill to deal massive damage. If it is bugged, reset the trial. Now the group gets to climb another set of platforms! This is like the first set of platforms, but the main difference is that once both sides are cleared the center group must fight alone. All three sides will have to cross rock bridges to move on to the next boss. The side groups should pull enemies slowly since there are far more foes this time. The raid will be overwhelmed if they try to move through this area too quickly. Varlariel looks like a wispmother and uses a few abilities reminiscent of them. Many Drops: The boss is constantly throwing out attacks that land in random areas. These attacks hit hard and need to be avoided. They do not specifically target players, so individuals may or may not have to move at any given time. Split: Varlariel splits off fragments that must be killed. Each time she splits, the number of fragments increases by one, starting at three. These pieces don’t have a lot of health, and a few good DPS attacks should kill them in short order. Each fragment goes to a pillar in the room, starting at the pillars opposite where the group enters. Every new fragment addition will fill in pillars from back to front as the fight goes on. Explode: After splitting off fragments, Varlariel will explode. The damage of this attack scales up based on the number of fragments that are alive in the area. Killing some of the fragments is better than killing none, although ideally she will be dead before there are enough of these to be an issue. The Mage aspect fight is a little different from the other fights leading up to this point. There are two sets of foes to deal with before the mage, with the boss spawning and engaging the party once both groups of monsters are dead. Generally, the players should group up to kill the enemies. Saving a single enemy for a while allows you time for recovery of stats. However, that time seems to be limited, and if the party takes too long to defeat it, the mage will kill the last enemy and shows up when you aren’t expecting it. Prepare ahead of time for this fight, and try to hold off on killing the last enemy long enough to get in position for the Mage spawn. Then, call for the players to kill the last foe. Axes: The Mage calls upon magical axes to attack the group. The tank must taunt and hold them in place. The axes hit hard when unblocked, but DPS players and healers can survive easily while waiting for the tank to pick up axes by blocking. As the number of axes grow, the damage increases, and so the tank will need both more healing and frequent shards to keep stamina high. Mines: Mines will appear throughout the fight at random places in the battle area. Those with a strong damage shield can remove them without dying. Use caution since mines can be stacked in one spot throughout the fight. In general, with solid DPS, you can ignore most if not all of the mines. Mini-Mage: Every so often, a mini-mage will fall from the sky. The crash landing causes damage, and it can fling you away or off the battle area. The impact can send players flying up into the sky where they can’t fight. Eventually, they will fall and die. Players should learn where the landing spots are so they don’t stand in them. Dark Beam: The mini-mages fire three dark beams out at random members of the group. These beams cause heavy damage and cannot be interrupted or avoided. Kill the mini-mage quickly to save your healers from having to heal through this attack. Growing Corruption: The Mage also uses a wide area attack that throws a small glob of darkness on the ground. This glob will expand to a large diameter and deal heavy damage to anyone within it. It will dissipate with time. In general, players should stay near only one other party member during phase one of this fight. When forced to move by this circle, don’t group with more than two other raid members. Chain Lightning: This attack targets a random player and leaps to anyone within a given distance. It will only hit each player once. This mechanic ensures the group spreads out. 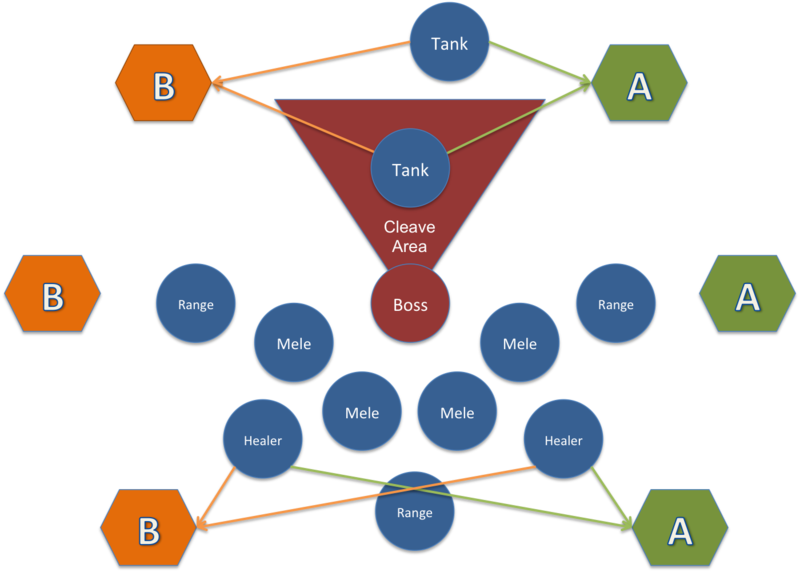 The group should encircle the central platform, with healers in range of the tank who can stand further out from it. A few melee players may be inside near the mage. You Shall Not Stand: At about 30%, the Mage slams down her staff three times. The resulting wave of force knocks back all players. At this time, players need to gather close together around the Mage, since the Mage will swap to attacking the entire group with damage every second. Healers need to use their area healing effects to keep everyone alive. Mines do not disappear until the third slam, so be careful about where you go. If she is surrounded by mines, a single player may need to sacrifice him- or herself in order to clear her feet. Those with strong health bubbles can detonate mines to help the group. This is a very healing intensive part of the fight. The DPS players need to burn as fast as possible to defeat the Mage before healers running out of magicka. With a little final lore, the players will conquer the trial of Atherian Archive. A portal will spawn which takes the group back to the start where they can turn in the quest and enjoy the new loot. Hel Ra is a 12 person trial. You will have 1 tank, 2 healers, and the rest as dps. Having off healing is a good thing… especially for the last fight If you are aiming for a speed run, do not forget to have one person use rapid for the long ride at the beginning and be sure that everyone horse speed stat is maxed. The first stop point is on the bridge, before the last set of torches. At this point, everyone should gather. When everyone is ready, ride as fast as possible to the bottom of the stairs. Pull adds, group up, and aoe stuff down. The boss comes in three waves. The first wave is waiting by the door for you. The subsequent waves come whenever the prior wave is killed. Adds 1– Aoe these down. Adds 2– Chains them in and Aoe them down or have people in melee range to bash the flame spinners. Tank faces boss away. Tank should be stationary, excepting possibly during whirlwinds. Blade toss: this is an X pattern from the boss that causes a large amount of damage. Standing behind the boss is the desired idea. Tornados: these are small little red circles which chase people around. Dance in a small circle around them if they are on you. Don’t drag them over other people. Whirlwind: this ability only appear once the boss reach 30% health: the boss spins, causing very heavy damage to all in range. Damage reduction effects like nova help. The tank should be the only one even considering standing in this. You will now split the raid. The tank, a healer, and 4 dps go straight ahead, usually called the left side. The other healer and 5 dps go right. The tank group starts the event by moving in. You can sneak past the mobs up to the next closed gate and huddle really close in the right corner while waiting for it to open. The right group will see the door open and they should roll through. The right side will repeatedly clear trash and pull levers to allow the tank’s group to move forward. Eventually, they will clear some catapults. You can avoid pulling one gargoyle with care. Once the catapults are cleared, the tank group can move through where they were bombarding. Each group will engage their own boss. This is the tank group boss. The tank will pull the dogs. The DPS will deal with the boss. He will face the dogs away from the group. -The dogs have a back-kick: Do not stand in melee range behind them. They spawn more during the fight; the tank should keep picking them up. -The boss fires an arrow that causes fire to shoot out of the area. Avoid the fire. -Healers have to split attention, so DPS must remain close enough to get heals. -Once the boss is killed, dps kills the dogs. This is the right side boss. -Yokeda Kai launches meteors: They hurt. Get out or block them. -Yokeda Kai uses the flame spin maneuver: He must be interrupted. A dps should remain close to bash. should be focused on healing. Binding bash to a hotkey is a good idea here. The other mechanics remain in play, so avoid meteors, bash the flame spin, and kill the split portions. Split portions have far less health than the boss. 1 of the 4 is the boss. Kill split portions, including use of executes, then return to hitting the boss. You will notice that the split portions show up with the same % of health the boss has, so as the fight goes on they are easier to kill. The next portion is a horn, guarded by a lonely trash mob. Kill it. The horn is an achievement, so letting new people blow the horn is nice but will make all the mobs rush towards it instead of you engaging them. Hard mode is not under discussion here. To avoid hard mode, do not poke the statues as you walk in. Regroup by walking along the wall to the right, and waiting by the blue circle. Besides the warning above about not poking the statues, you do not want to walk in the water either.Getting too close can pull the boss. Tanks cannot drop block against him, except when he has leapt away. Use shards and other stamina restoring methods. You should already have been using these methods, but this time it is super important. -The Warrior is tanked so he stands outside the blue smoke. This smoke is a dps booster, so if he stands in it he hits harder. Similarly, so does everyone else. Stand in blue smoke as long as it is there. -The Warrior throws his shield: This is a straight red telegraph. Move out of it, or, if you cannot, block. It flies out, then back in. Each hit causes damage. -The Warrior leaps: This is a pair of red circles telegraphed with the smaller denoting the center of the larger. Some call it a doughnut. Roll or run out of this… it will kill. -Adds: there are melee and caster adds. You have seen them before, block the sword hits and bash the casters while you kill them. Adds are priority 1. -Statue shatter: The Warrior will shatter the healing statue, then the dps statue. Once he shatters the dps blue smoke statue, everyone can move to make a circle around him.
! !If you take too long in Phase 1, he enrages, and you wipe to a mass of adds.!! -The warrior runs over, and pulls out a great sword. He then lifts this up, and blows away the roof shortly. Pay attention to this, because he will do a similar move throughout phase 2. This one is just a knockdown with mild damage. -Cleave: this attack is much like the shield throw, but it hits harder. Get out. No blocking. If you are in it, you are dead. This is an outward motion only, no return blow. -Starfall: this is the effect like the roof explosion. He lifts his sword up, and everyone must collapse to a designated point. The platform in the center works well. For ~6 seconds he deals massive AOE damage. Heal through it. If you have any off healing, use it. You need off healing here and having a restoration staff on your off bar for this is recommended with at least healing springs for the AOE. Having additional AOE heals will help. If you don’t heal it, you wipe. Immediately after, spread back out… or he will kill people with cleaves. Follow the first path along the cliff, eliminating the mob groups that come towards you. At the end you reach the boss room, where you will find a mini-boss in the middle. After his demise, the two fire bowls are activated next to him. Once these are activated, several waves of mobs spawn that you have to fight. Dragonknights should consider pulling in the Scaled Court Conjurers (horned helmets) & Archers with their chains to facilitate the fight. They come 2 at a time and once these Conjurers die then the endless waves stop coming, so the quicker they die the better. We recommend a stack formation (each player stood directly on top of the other very close together). DK Deep Breath ability can also be used to interrupt the Flame Paths & Arrow Spray abilities the mobs have. The boss appears even before the last wave is eliminated so careful not to agro him before your ready. Sanctum Ophidia was upgraded to include both a Normal and Veteran mode. On both versions the Mantikora now does an AOE Cleave Heavy Attack. This will kill anyone not blocking or not a Tank in the Cleave radius and it is pretty huge. Also the Health of the Mantikora was increased from 13.7million to 38.7million, which means no avoiding the Black hole on Veteran mode. So which roles and groups do we need to make it passed Sanctum’s first boss. Both Tanks need to be able to tank the Main boss and the Black Hole boss at anytime during the fight. Remember this when your adding DPS to your Offtank build. Healers need to recognize the moment to change roles from DPS to Healing, otherwise they try to also keep up as much DPS on the boss as possible. Unofficial Group #4: Off-tank + 1 DPS. As there are 5 stood around the Mantikora 1 DPS must move away from the Manti towards the Off-tank as the Black Hole is about to drop. This helps to stop the problem of no Tank in the Hole. Each group is a self-contained black-hole team with the healer stood in the middle on the side groups and each group is well distanced from the other groups. The 2nd tank can melee DPS the boss or be solo ranged DPS between the groups ready to join whichever group gets sent to the black hole boss. As soon as the black hole emerges there are a few scenarios that can happen. The black hole forms on top of a person in Group #1. Off-tank jumps in the black hole while Group #2 & #3 run quickly and stack on top of the Main Tank. The black hole forms on top of a person in Group #2. If the Main Tank is in the black hole, the Off-tank taunts the Main Boss while Group #1 & #3 run quickly and stack on top of the Off-Tank. If the Main Tank is not in the black hole, the Off-tank jumps in the black hole with the others from Group #2. The black hole forms on top of a person in Group #3. Off-tank jumps in the black hole while Group #1 & #2 run quickly and stack on top of the Main Tank. Always face the Mantikora away from the group. Earth Runes are not too much of a problem. Dodge the first one to the side or backwards, walk out of the 2nd Rune and then dodge inside the 3rd Rune back into position. It’s very important for the DPS that the boss is in a good position and standing still for the most amount of time possible. What you should be careful of is getting too much DoT damage from the Culminating Slam poison damage from the bosses huge AOE (this means someone didn’t block), or from the Hemorrhage DoT that the boss puts on you with it’s heavy attacks. This Hemorrhage only occurs from heavy attacks done by the boss during the Poison Shard phase. There’s a video below of the Boss fight from the Off-Tank’s perspective. The Main Tank taunts the Boss out of it’s starting position (the red misty spot underneath ‘Group 2’ in the image above) and into the middle of the arena (black square). Group 2 moved in as the boss passed by and all groups spread out in their area, giving a good distance between each player. The Boss puts red-circles below 2-3 players at random. There are 3 red circles one after another on the same player. Roll dodge out of the first one quickly (away from your fellow players) then walk away from the 2nd circle. The 3rd red-circle forms slightly later and is bigger than the first two. Roll dodge inside the 3rd AOE and you will be perfectly safe from damage. After a 2nd round of red-circles the Boss will do a massive AOE. This need to be blocked. For every block which is missed every player recieves 3-5k damage times the number of blocks missed, so blocking this is extremely important. A black hole will now form at a random location underneath at least 1 player. Whichever side has the black hole on it, all of that group goes in, aswell as the roaming Offtank. The remaining players not in the black hole must go directly to the back of the Mantikora and remember hold block when the Slams appear. When the Main Tank moves the Mantikora you move with Manti. The Main Boss drops a poison red-circle that does a heavy bleed effect. The Main Tank must keep the Boss facing away from the rest of the group because of the Cleave. 5 DPS can stack at the back of the Mantikora. 3 players (usually both Healers + 1 Ranged DPS) stay out of the group and away from each other. The Poison Shards will drop on these 3 people. Make sure to block the Shard if it does land on you as the impact stuns you. You can start moving out of the poison while blocking as soon as the red AOE starts forming below you. After the shard has landed you can let go of block and walk out. Every other Poison Shard the boss will do the Culminating Slam so everyone must block it or everyone gets heavy poison damage. A Nova (Solar Disturbance/Prison) or Veil of Blades can be put down on the boss or on the group respectively to help negate the damage from the Slam. The black hole team emerges victorious after beating their boss. The Main boss is stunned by this and everyone awaits the final Culminating Slam attack. Then they split into Groups #1, #2 & #3 again and you go back to the Earth Runes stage. Repeat this until the Manticora is dead. If you get the Mantikora down to 20% or lower and he drops a black hole, think about maybe staying up top and trying to nuke it down quickly. You still must all block the Slams! There needs to be the Offtank or Main Tank and 3 DPS going into the black hole as there is a boss in there you need to defeat. And you only get around 100seconds to do so, otherwise the Main Boss enrages and kills everyone. Getting in there quickly and keeping some ultimate for this phase is a good idea. The Tank down in the black hole must turn the boss away from the other players down there, the boss’s Cleave attack is deadly. The Tank can also stay very very close to the boss and when it cleaves simply sidestep round the boss out of the attack and back in position. Vigor, Shuffle, Coagulating Blood and Igneous Shield will allow you to live without a Healer. Well done for getting it this far. Manticora isn’t an easy first boss. Luckily you can relax for a while now, only a short while though. The next areas are filled with Rockheaver Trolls, Scaled Court Overchargers and War Priests, as well as smaller mobs. As a general rule from now on and until reaching the final boss the Main Tank will taunt the Trolls & War Priests and keep them on him, and the Off-tank will taunt Archers & Overchargers. DPS focus down the Overchargers as a priority. Overchargers do an ability called Call Lightning. This is your main cause of death. It is growing Lightning pools below 2 random players feet which Slows you on each hit, hits rapidly and with alot of damage. Make sure you watch out for this below your feet, do a circular or square movement to avoid getting hit but don’t overlap any other player or they will be hit by it. After the first room of mobs, you descend the staircase. Stay away from the Tank as the Trolls will throw a Poison AOE called ‘The Gift’ on to him. Any player who stands in this AOE will recieve the gift. As you go onto the bridge the Overchargers spawn on the right and left sides. Quickly focus down the right Overcharger with Ultimates and debuffs before he gets a chance to get off Call lightning. Be careful focusing the 2nd Overcharger as his Call lightning will target some players. The Main tank moves forward and greets the incoming Trolls and other mobs. He taunts the Trolls and quickly moves back behind where the group is on the bridge. This brings the Trolls right next to your stack of DPS and once the Overchargers are dead they die from AOE very fast. Once the first banner is done, swop to the right-side and repeat the cycle of Overchargers > Trolls > War-Priest prioritization and Main Tank bring the Trolls to the DPS by moving back behind the group. Stonebreakers ‘Avalanche’ attack now travels in 3 different directions. The Main Tank can still keep the Boss facing him for the main damage if he backs away from the Boss slightly before the Boss uses the Avalanche. Stonebreaker Boss can be done a few different ways. The first is for the Main Tank to keep the Boss off the Bridge towards the next Switches/Doorway, away from the rest of the group. DPS should quickly kill the first Archer and War Priest that spawn with the Boss. Once they are dead, DPS go to the Boss and do damage to 75%. At 75% an Overcharger will spawn at the end of the Bridge. DPS quickly move to it and kill it, then back to the Boss. Repeat this for 2 Overchargers at 50% and 3 Overchargers at 25%. Another way to do the Boss is for all players except the Main tank, Off-tank & 1 Healer to run back across the bridge to the end we came from. The Tank, Offtank & Healer then bring the Stonebreaker, War Priest and Archer to the other side of the Bridge. DPS quickly kill the Archer and War Priest and then just focus the Boss. The Overchargers will not run across the bridge and instead all stand waiting for you after the Boss. At 20% or near abouts the Stonebreaker will go enraged. It’s even more important now to have good positioning on DPS and healers, and to block Avalanches and Slams. Once you defeat Stonebreaker you will have to hit 2 levers at the same time to open the next door, and then once again you have 2 levers and a room with 2 doors. Get Groups #1 & #2 close to the Left doorway, and Group #3 over by the Right doorway. Press both levers and the left group goes in, DPS focus down the Overchargers while the Main tank goes up the stairs, taunts the Troll at the back and makes his way back down the stairs and behind the boxes. This brings the Troll into the middle of the DPS, and keeps the poison only on you. The right door kills the mobs on that side and 1 DPS goes and waits by the right lever while the healer and other DPS go back to help the Left side. When both sides are down, 1 DPS press each lever and everyone in the middle except the Main Tank stay close to the Trolls that come through the next door. The Main tank stays back in the room and keeps the Troll poison just on him/herself while the DPS finish them. Next room has a wooden walkway, everyone quickly cross the walkway and stack at the end of it. This spot is safe from the ‘random’ Poison strikes which drop around the area. The Main Tank grab all 4 Trolls and stand either behind the group again or far across the room away from the stack. Once these Trolls are down, trigger the next set of mobs by walking up the stairs. DPS and Healers stay on the right side and Main Tank on the left of the stairs taunting the 2 Trolls. Another set of Overchargers and smaller mobs and 3 Trolls. DPS/Healers run and stay close to the trolls, Main Tank taunt all the Trolls and stay behind group again. Watch for random Poison strikes here it is a small space. When this mob is down, pick either the Left door or the Right door and repeat the same strategy twice more on each room. 1 DPS each go to the Left/Right levers and press at the same time. Another stairs of mobs and Trolls and then the large mob packs. Once you get to the top of the stairs all quickly move to the left passage and hide behind the box (seen in screenshot below) and await the mobs and Trolls. When they get close enough to the group, roll dodge out of the surprise box and throw down 1 Nova. Main Tank can keep the Trolls on him and move to the middle. Just before the last mob dies, everyone move quickly to the middle of the room and then stack behind the fire brazier. When the next mob pack comes out there will be 6 Trolls. The Main Tank must taunt them all and keep the poison only on him. A Nova down here and some Ultimates saved for this can help wipe it fast. The key to Ozara is to Unbolt and Revive. These 2 things must be done quickly. Two ways to do this Boss. The normal way is to have the Main Tank hold Ozara & the Overcharger. The Off-tank must hold the War Priest, the Troll, the Archer & both Skirmishers. The Main Tank is positioned at the Overcharger spawn door and taunts the Main Boss to there. The Off-Tank stands to the side of the group and keeps the Archer arrow spray facing away from the group, aswell as the Troll AOE Slams. Healers and DPS must form a Half-Circle around Ozara & the Overchargers with 1 Healer on each side. DPS Focus the boss but keep your AOE damage abilities on both Ozara and the Overcharger. The Overcharger will respawn some 15 seconds after it dies. Not unpinning your teammates quickly, or stacking too close together, or not reviving quickly enough, will result in a wipe. As you enter the fight, after 5-10 seconds Ozara will pin 2 random players to the floor in a lightning AOE. Other players can release them by standing in the AOE and pressing their Synergy button (default X). Remember the Troll Poison and the Overcharger Lightning AOE. If too many people try to get the same person up sometimes this can result in alot of deaths. The Main Tank has to stay at the Overcharger door. Create a half-circle of melee DPS around the back and sides of the Boss. Make sure none are overlapping. Add 1 Healer to each side on a 2nd row. Now fill in the 2nd with the rest of the DPS. These are the positions people must stick to. Too close together and the pins overlap and players get Vaporized. Everything is the same except 1 DPS slot Inner Fire and a Group Heal ability. They stand near the entrance to the Boss arena with the Off-tank. When the fight begins, the 1 DPS taunts the Overcharger, runs to the Shaman and kills the totem. Keep the Overcharger taunted and once the totem is dead run back through the entrance door taunting the Overcharger every 15s. Keep running through the level until your team complete the Boss. The same goes for the Off-tank. As the fight begins, taunt the Archer, the War Priest & the Troll and run out through the entrance door and back through the level. Make sure you keep something taunted to stop them losing interest. Once the boss is dead, Main Tank move to the next door out of the room and taunt the 3 Trolls as they come through. Move through them and up to the top of the next ramp. DPS stay at the Trolls and AOE them down. Next room is another larger mob pack, and the last pack of mobs before the final boss (unless your doing the feeding pit). Everyone run and stack up behind the stone (in screenshot below) and make sure your behind it so the mobs can’t hit you. The Tank and Off-Tank roll dodge into the mobs and try to taunt as much as possible, each moving to one side door each. The DPS and Healers either stay ranged or right on top of the Trolls in the middle of the room. Dont go near either Tank and prepare for poison on everyone. Victory is within sight, only The Serpent himself to beat and if this is your first try on this boss you can expect a lengthy fight. If your food has less than 20 minutes maybe think about taking some more. Repair any armor that might be broken also. If your the leader of the group, you need to check a few things. First is that everyone has a High-Cost Magicka ability on at least 1 skillbar. This is a skill that costs alot of Magicka to cast. Examples are abilities such as Purge or Seige Shield from the Alliance War Support skill line. These can cost 6-8k Magicka. Second is your Mitigation order for the Poison phase so usually 3 Healers with 3 Novas is enough, with perhaps 1 Nightblade with a Veil of Blades as backup. If you have players with the Aggressive Horn skill from Alliance war Assault skill line then do a rotation for horns aswell. Third, the Off-tank is now ‘The Lamia Team’. He will keep the 2 Lamia’s busy while the rest of the fight is going on. Finally organize how your group is separating for the Orbs phase. Usually with our groups we have each Group #1/2/3 going a different way from the middle circle where everyone is stacked. This usually gives the highest chance for everyone to pick up one Orb. Group #1 goes Left (as we’re looking at the boss from entrance door), Group #2 towards the Altar and Group #3 goes to the Right. Your going to be facing the Boss away from the rest of the group so that the Boss’s Cleave attack only hits on you. Anyone else caught in this will usually be one shotted. Using Heroic Slash on the Boss lowers it’s damage and increases your Ultimate gain. During the majority of the fight your the only person who will recieve damage (apart from the Off-tank on the Lamia Team, and during the Poison phase). This means you only really need 1 Healer healing you and the other Healer can DPS. Again, prioritize Aggressive Horn over Magma Shell, and use it when you’ve got the Mantikora taunted next to the Serpent. Your job can be nice and relaxing. Taunt both lamias. Run around. Evade them. Dance a little. But make sure your in the healing springs when the Poison Cloud comes. Where ever you chose to keep the Lamia, watch out for the Blob on hardmode. As mentioned, you might want to have back-bar DPS available for when the Main Tank is alone with only the Serpent. One healer can stay healing the Main Tank so decide who is doing what between you before the fight. Remember constant shards at the back of the boss for your Stamina DPS players. 1 Healer try to run with Elemental Drain on the Serpent and aswell on the Mantikora when it comes up. Stack Elemental Drain and Siphon ability from Restoration Staff, your Magicka players will get their Magicka back from attacking the target. Your Novas are very important for the start of the Poison phase. When the boss comes out of the ground the first Poison strike hits harder than the rest so have your HoT (Heals over Time) down on the middle circle before this hits. Once you pass the banners the Main Tank taunts the Serpent and faces him away from the rest of the group. Take him to the centre of the circle. Everyone else group/stack up at the back of the Boss (this is good practice for the Hardmode also). The Boss goes down underground and appears again in the centre of the circle. He strikes the ground releasing a Poisonous Gas that fills the entire room. Everybody stack on the circle and use your Mitigation rotation here before he strikes the ground. After he finishes the Poison he does a Cleave attack as soon as he stands up. The Main Tank must taunt him and move backwards so when the Boss stands up he moves to the Tank and then does the Cleave, away from the group. Second Mechanic: The Totems & Lamia. As soon as the Poison ends the Lamias come from the Left side of the arena and 2 Totems (1 Green 1 Blue) appear at random around the arena. The Off-tank must taunt both Lamia and keep them out of the DPS AOE damage. So the less damage taken by the Lamia the better! The Buff totem has a beam that heals/buffs the Serpents HP/resistances. The Pull and can pull one player to it at random. If the green beam is on you roll dodge immediately back to the group. It may take 2 roll dodges until you are out. The Blue Totem is the Magicka bomb Totem. This puts a Blue glow on a random player every 20-30 seconds. That player must very quickly drain all of his Magicka down to 10% or as low as possible. However much Magicka you have left when the bomb explodes is times’d by a multiple to calculate the damage you take. After the Totems & Lamia there is another Poison Phase. When the Poison ends a Mantikora will appear from one of the pools of water in the arena. There are 2 different ways to do this; one, the Main Tank taunts it aswell as the Serpent and they stay close and DPS AOE them both; or two, the Off-Tank takes the Mantikora into the circle and the DPS quickly Single target it down. DPS try to save your Horns and Damage Ultimates for killing the Mantikora, it needs to die very fast and has 1Million HP. After the Mantikora’s dead the Serpent goes down again for another Poison Phase then another Lamia phase, then Poison again, and then another Mantikora. Fourth Mechanic: Orbs! Stand on them! After the 2nd Mantikora dies (and after every 2nd Mantikora thereafter) there is another Poison phase and then the Orbs phase. Just before the Poison ends, get your Groups #1-3 in position on their appropriate sides of the circle. As it ends, glowing pink orbs appear on the ground around the circle, to the left, to the right and near the altar stone. Each player must pick up 1 Orb and 1 Orb only. Prioritize the Main Tank, the Off-tank and the Healers. As soon as the explosion goes off, anyone not with an Orb Shield will die so prepare to revive them straight away. After 5-10 seconds the Boss starts the cycle again from the First Mechanic. The Last Stand: Extended Poison and Orbs! When you get the Serpent down very low, 1-4% health, he will go down for a final Poison phase. This lasts until the boss is down to 0% health and then even longer! So don’t stop healing and DPS, throw down any mitigation you might have and get ready to grab the Orbs of victory! All you need is one player alive to grab an Orb and the Serpent will be defeated. Congrats and don’t forget to loot in the excitement, and grab your coffer. Before entering, the trial leader will divide the raid into 2 groups, 6 each (1 tank, 1 healer, 1 Mag DK, 3 DPS) due to the fact that the second boss is actually two bosses that need to be killed within 20 seconds of each other. It’s important to understand before you begin that there are many strategies to use to battle through the trial. Each successful group will determine their own preferred way, so be sure to clarify in advance the strategies used if you will be running with different trial leaders. Synergies need to be constantly available for both Tanks using Alkosh, so everyone needs to be using as many synergy skills as possible, such as shards, orbs, liquid lightning, etc. You will encounter a small mob pack of conjured monks, the easiest enemies, who will appear alongside the elite enemies throughout the trial. Next, a Sun-Eater, Shadowguard and a Dreadstalker will spawn. Kill the Sun-Eater laying down pre-damage and dropping ultimates as soon as it appears. Move to the Dreadstalker, who the tank has facing away from group. Then kill the Shadowguard. Go through the door on the left and up the stairs. Lay pre-damage in front of the stone archway to the right, as the Sun-Eater will spawn here. Next, kill the two Dreadstalkers, which the tank will taunt at the top of the hill. Finally, kill the Shadowguard, which the other tank will have brought to the bottom of the hill away from group. Head up the hill and get ready for the final mob before the first boss fight. Kill the Elite enemies in the way and same order as above, with the tanks splitting the Shadowguard away from the Savage. Before you start the fight, notice the cleanse pads around the room (refer to the second bullet below for cleanse strategies). One healer and one Magicka DK will be on each side of the boss. To start the fight, the tank will pull taunt the boss in the middle of the room and pull him slightly towards the right hand wall (as you enter the door) to be positioned in between the first two cleanse pads. The melee players will be the closest to boss, in a loose stack around him, leaving enough room between players that curses won’t spread. The range DPS will be in a loose stack around melee players, again with enough room that curses won’t spread. The off-tank will be positioned to the right of the main tank, far enough away as to not spread curse. Healers will be positioned one on each side to be able to keep all players in healing springs range. Panthers: Summons Sar-m’athra Panthers. 2 at 80%, 3 at 60%, 4 at 40% and 5 at 20%. Unable to be taunted, the Mag DK’s will pull chain the panthers into the boss and use talons, so DPS can kill with AOE attacks. Off-tank will assist as needed with pull chain and talons. Curse: Places a red AOE circle below 3 random players. Any players in the AOE will be cursed. If other players are too close to those cursed, they will also get the curse. Use the cleanse pads around the room to cleanse. The cleanse pads have a respawn timer of around 25 seconds. One strategy is to assign players to pads, with tanks and melee players sharing the two pads closest to the boss, healers and Mag DK sharing the next cleanse pads, and all other DPS sharing the remaining 4 cleanse pads. The other strategy is an ‘A’ and “B” side approach, with A being the 3 pads left of tank (based on position indicated above) and B being pads right of tank. With only 3 players being taunted each curse round, there should always be a cleanse pad available. Pillars: Summons Void Pillars on a random player who is far from the Boss, so it is crucial during the entire fight for all DPS to remain in their loose stack close to the boss without stacking curses. A double red circle will indicate a pillar is spawning. If you are the person the pillar spawns on, you can block to prevent yourself from being knocked to the ground. Never stand on a cleanse pad to wait for it to spawn. It is better to die in place than to spawn a pillar at the back of the room, or so close to the wall that no-one can get behind it. The longer the fight lasts, the fewer pillars will spawn. After 5 pillars spawn, everyone needs to stand behind a pillar during Cataclysm or you will die. Standing behind the pillar will save you from the explosion. Shield: Summons a Shield, one at 70% and a larger Shield at 30%. It’s important that all DPS be alive when this phase starts. Everyone will move closer to the boss and to each other, being careful not to overlap the circles underneath their feet. The shield must be destroyed before the damage done by the shield becomes too much for the healers to heal through. If the shield isn’t destroyed within a few seconds, it will begin to pulsate faster. Healers will maintain healing springs and alternate dropping nova. DPS can block cast to mitigate damage even more. Be sure to loot the boss before moving through the door. In the pass-through room to the next area, you will find heavy sacks and chests to open. In the next area you will encounter more elite enemies. The first wave will be Ogres, with the second wave being Banners. Kill the enemies taking care for tanks to split the elites as indicated earlier and for DPS to target in the order listed above. Continue down the path, taking care of all elite enemy groups, with tank and off tank taunting their respective elites. Once you reach bottom of hill, there will be 5 waves of elites that spawn. NOTE: If the group wipes at any time, you will have to start the entire elite mob fight from the beginning. All DPS and main tank will run into the cave to the left to DPS elite who spawn there, while the off tank taunts the Ogres who spawn in middle of the area, off to the side. Off tank will then pull Ogres over to where the DPS just came down from upper hill, meeting main group there to kill the Sun Eater as soon as it spawns. Ogres will be killed with AOE damage. After Sun Eater is killed, off tank will move towards door to far right of area taunting new designated elites which spawn there, while the rest of the group targets the banner elites in order as described above. Main group will then move to off tank to kill remaining elites and to be ready for next Sun Eater to spawn. When banner elites spawn again, tank and off tank will once again pull respective enemies apart from each other. Once you kill the final elites, the gates to next area will open and you can loot the chest. Split into the two groups as discussed at beginning of walkthrough, with each side noting the boss that is on their side. Each time there is a room split, all players will need to quickly return to their original bosses, whatever side that might be. To start the fight, all players will lay down pre-damage on the right side, where Vashai will initially be taunted. The reason for this, is that typically S’kinrai takes more damage during the fight, as his mobs spawn close to him so it’s easier for the DPS to continually damage him and mobs together. Vashai’s mobs spawn far away from him, hence pre-damage at beginning of fight, as well as all DPS on him during Prayer Phase is necessary. After pre-damage is laid down, both tanks will then taunt their respective bosses and players will then split into their two groups, with left side players continuing to do distance damage to Vashai (who is on the right side) until the first mechanic, Color Change, described below. Color Change: At the start of the fight 6 people will receive the Holy (light) Aspect and 6 people the Shadow (dark) Aspect. If you stand too close to a player of the opposite Aspect to your own, you will both explode. As soon as the Color Change happens, the Tank and Off-Tank will taunt the boss with the opposite color head, pulling the bosses each to their side, allowing players to DPS the boss at a safe distance from the players with opposite color head. At this time, all players must switch from DPSing Vashai to DPSing the boss with the opposite color head. This means the left side will now be DPSing Vashai and the right side will be DPSing S’kinrai. The Rage of Skinrai and the Will of Vashai: Light and Dark mobs spawn in waves starting with 1 enemy on each side, increasing in numbers the longer the fight progresses. When the enemies spawn, you will hear an explosion. The Magicka DK in each group needs to chain pull the enemies with the same color head as their Boss so the group can AOE the enemies down quickly. Chain pull, Deep Breath. Chain Pull, Deep Breath. S’kinrai’s mobs will cast the “Lunar Flare” skill on up to 4 players in their field of view, which can be purged. They also cast the “Lunar Destruction” skill, which is similar to the Templar “Radiant Destruction” skill. This should be interrupted by bashing or with the DK “Deep Breath” skill. Vashai’s mobs throw 3 Void Orbs that do more damage the further they travel. The DK must stand between them and the wall, keeping them facing away from the group, or pulling them close enough to the tank so the tank can taunt them and prevent them throwing orbs into the opposite group, where they will do a lot of damage.Not long after this phase begins, another Color Change will occur affecting 3 players on each side. If you have combat text turned on, you will see ‘conversion imminent’ text on your screen, along with a glowing circle under your feet. You only have a few seconds to get away from your group. Each group of 3 players must move clockwise away from their original group and towards the opposite group, to prevent players from getting too close to each other. Players then must DPS their ‘new’ boss until the next mechanic. When one healer is affected by this Color Change and the other one is not, that healer will need to heal their original group from a distance, usually on the same side of the candles as the new head color group, but in the center of the room so spells can reach the original group. Prayer Phase: Vashai and Skinrai will teleport to a random side of the room and the floor will glow half light and half dark. The group must run quickly to the boss with the opposite color head (and floor). (Some groups run clockwise, others run counterclockwise). If you don’t make it across the candle line to the opposite color room in time, you will die instantly.A few seconds after Prayer Phase, the color above all player heads will disappear and each player must return to their original boss immediately, running straight through the center of the room. If there happen to be people dead during this phase, hug your original color boss so that you will not randomly get the opposite color head.Now it’s rinse and repeat. The Tank and Off-Tank will taunt the boss with the opposite color head to bring the boss to their group. Players will DPS, mobs will spawn (remember, one more each time this phase happens, if you get to the point where 5 spawn on each side, the team will wipe) 3 player color change will happen, prayer phase and then returning to their original boss. Repeat until one boss is killed. When the twins are both under 20% health, the raid leader will make the call of whether to execute one of the twins and ignore adds, or to go another round of killing adds before executing. If the call is to ignore the adds, the Mag DK’s will chain all of the mobs away from the group and use Deep Breath as much as possible. All DPS will focus on the twin called for execution, taking care to remain away from players with the opposite color heads. Healers will use the Barrier Skill when needed to mitigate the massive damage output of the mobs. Simultaneous demise: Once one of the twins dies all players will lose the colors on their heads and a timer begins. The remaining Boss will teleport to the center of the room and after 20 seconds it will explode with nowhere to hide and all are killed. This means both Bosses must take very similar damage during the fight to avoid one Boss dying far too early. After defeating the twins, loot the chests and heavy sacks in pass-through room and head to next area. Go through the gate, making sure no one gets left behind as the gate will close. Players can get through the gate after closing, but it may take a few tries to get the Open Gate prompt. Once inside, you will see giant panthers, which cannot be taunted. Everyone should mount up and upon trial leader command, start riding around in a circle together. As soon as each panther “marks” a player for death, everyone can dismount and begin DPSing the Panthers. The players who are marked need to run from the panthers so as to not be caught. After 30 seconds, both panthers will mark another player. The group will just follow the same instructions above until both panthers are killed. Next are multiple waves of Banner enemies which will begin with the pull of a chain. There are two chains to pull, both at the top of the right and left paths. Unless you are going for the achievement to pull both chains at once, only pull one chain at a time. Note that if the group dies during this phase, it will begin all over again. Dreadstalker, Shadowguard & Savage – These enemies will spawn a few seconds before the rest of the enemies so all DPS should lay down pre-damage before they spawn. The Shadowguard and Savage should be pulled away from the group by one of the tanks before the Sun-Eaters spawn. Once all enemies have been killed, proceed up the hill to open the chest and into the next area, to battle more waves of Banner enemies. The next room is long and narrow. Here you will battle three waves of Banner enemies and Cursed Monks which will drop down from above with an AOE that does massive damage. This can be mitigated if Caltrops is continually thrown in the area. Someone in the group will get the ‘Mark of Death” placed on them by the Dreadstalker, making all panthers target you. Player should run around the outside of the room to pull all panthers away from the rest of group. Sun-Eater – Will spawn on the right-hand side of the room against the wall, about mid-way down. All players should immediately run here and lay down pre-damage before the Sun-Eater spawns. Dreadstalker – Spawns on the far left-hand side of the room. Should be taunted by one of the tanks to face them away from the group. Savage – Should be taunted by tank who has the Dreadstalker and pulled away from the group until all of the other enemies are killed. Tank should stand at the end of the room, mid-way between walls. 2 Sun-Eaters – The first Sun-Eater will spawn on the left hand side, against the wall. All players should DPS the Sun-Eater over any other Banner enemies still alive, or just spawning. After the first Sun-Eater is dead, the second one will spawn on the right hand side of the room. 2 Sun-Eaters – Will spawn both at the same time. One on left and one on right-hand sides of the room. DPS should kill the one on the right hand side first, then move quickly over to the left side. 2 Dreadstalkers – One will spawn close to the entrance and the other close to the exit. Both should be taunted by one of the tanks close to the exit door. Head through the pass-through room to once again loot the chests and collect items from heavy sacks, then proceed into the final room for the Rakkhat fight. The High Lunarium room is divided into two main areas: one large inside room and one outside area, called the backyard. Before starting the fight, the trial leader should assign pads to all DPS (1-8) for the lunar phase. Typically you would alternate range and melee DPS with the backyard players assigned to pads 1 and 8. The trial leader should designate two players and one backup to run the outside (Backyard) area, which will happen a few times during the fight. Players who run the Backyard will receive the Shadow Debuff and will need to cleanse each time after they travel back through the door to the main area, on one of 4 cleanse pads in each corner of the main area. There are two items of note: Each time one of the pads turns gold, the first player who stands on the pad will receive a Lunar Bastion Buff, giving them reduced damage from Rakkhat and other mechanics. Therefore it’s important that only the main Tank steps on the pad first. After the light goes away from the pad, it will be replaced by a dark blue glow, which indicates the Shadow Debuff is now active on that pad. Anyone who steps on the pad will receive a healing debuff, reducing health. Therefore it’s important that none of the DPS ever step on the pads when they are blue, as it will force them to have to die, as there are no cleanse pads available for DPS, only the Backyard runners. Any deaths in this fight mean a significant loss of DPS and can affect success. Backyard: The area behind the Dark blue portal. During the fight, the first Hulk will spawn and Rakkhat will slam the ground. You will see 6 shadows appear in the center pad indicating it’s time for two players to enter, expose and kill the 6 Dro’mAthra Shadows which are hidden in the Backyard: 2 in the top area 2 in the left area, and two in the bottom area of map. The two runners will split the area and run the path indicated above (note that this only one suggested path), stopping at each carpet and hitting the synergy to expose the Dro’mAthra Shadow, if it is there. Each Dro’mAthra must be killed before the player moves onto the next carpet location. Once the player has exposed 2 Shadows in the top, bottom or middle, they can skip the rest of the carpets in that area and move directly to the next area. Note: Sorcerers are great as runners, as they can use the Boundless Storm skill, which will accelerate kills and also get them around the room faster. Once all 6 Shadows have been exposed and killed, the 2 runners will come back through the portal, cleanse and begin DPSing the boss until the next set of Shadows appears. Rinse and repeat. Note: the cleanse pads will not respawn until after lunar phase, which means if the team’s DPS isn’t high enough to kill Rakkhat prior to Lunar Phase, the Backyard runners will need to alternate cleansing, dying and cleansing. Note: there is a timer on the shadows which appear in the center of the room. If they aren’t exposed and killed in the backyard prior to the shadows in the main room sinking into the ground, the entire team will die and you have to begin the fight again. The Hulk: Rakkhat’s main elite enemy, which will spawn 3x prior to Lunar Phase. The off-tank should taunt the Hulk as soon as he spawns, as he will throw a debuff similar to Shattered Armor on his target. After 2 debuffs have been thrown, the main tank will taunt the hulk once to receive the next debuff then the off-tank will taunt him back. If there is no handoff, the off-tank will usually die. Orbs: There are three types of Orbs in the fight, and the type will depend on what phase of the fight you are in. Void Combustion – Through Pad 4. A red AOE will appear under a player’s feet, indicating they should immediately move away from the group, preferrably in a corner which faces away from the group. The orb will explode, shootting out mini-orbs which will insta-kill other players if they are too close. Stalker Orbs – Pads 5 & 6. Floating blue orbs will appear causing a dot affecting 1-2 players at random. The affected player must move away from the group (making sure not to pull the orb through the group). The closer the orb gets to a player, the more damage it will do. AOE Orbs – Pad 7. Red circles will spawn under a group of players feet and after 1 second, orbs will appear and deal damage to anyone who is still standing where the red AOE spawned. 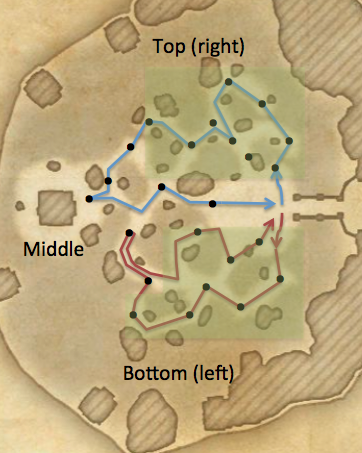 The DPS players should move together as a group to one side or the other to get out of the red AOE areas and to not affect the tanks close to the boss. Lunar Phase: Pad 8. Rakkhat will slam pad 8 and then will rise up into the air. All pads will turn gold indicating they all now have the Lunar Bastion Buff. All DPS players must immediately go to their respective positions and begin attacking their elite enemy. 2 players will DPS elite enemies together. If the two players are both ranged DPS, they will just stand on their pads the entire Lunar Phase. If one player is melee and one ranged, both players will DPS the elite on the melee pad first, then the 2 players will roll dodge, swapping pads, allowing the melee to DPS the second elite. Players will work together based on these pad numbers: 1 & 2, 3 & 4, 5 & 6, 7 & 8.The Tanks will position themselves on the center pad at the 12 and 6 o’clock positions (based on when you first enter the room), while the Healers will position themselves at the 3 and 9 o’clock positions. Healers will throw breath of life as needed until a synergy appears. One strategy is for the tanks to synergize pads 1 and 5 first, and when the elite is killed move to synergize pads 2 and 6. The healers will synergize pads 3 and 7 first, then move to pads 4 and 8.When Lunar Phase is over, all of the gold pads will once again be dark and it will be as in the beginning of the fight, with pad 1 turning gold. Rinse and Repeat until Rakkhat is ready for execute. Note that any banner elites who were not killed during Lunar phase will need to be targeted and killed immediately when Lunar phase is over. 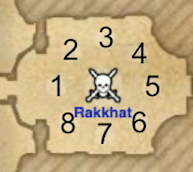 Execute Phase: When Rakkhat is DPS’d down to 11% health, he will move into the execute phase. The DPS players must be ready to move their respective pads as needed, starting with Pad 1. A Light Orb will appear which will be connected to Rakkhat. This orb causes him to take less damage, so it is imperative as soon as the orb spawns, the player assigned to pad 1 must immediately run across/roll dodge across the pad to collect the orb (not standing on pad) and then move to continue DPS’ing Rakkhat. Player assigned to pad 2 must now do the same for their pad, etc. All other players must focus DPS on Rakkhat until it’s time for them to collect the orb on their pad. This will continue until Rakkhat is killed. Note: during this phase, all previous mechanics will be in play, including hulks spawning. Players must utilize their own shields, pay attention to the Orbs, etc. and Tanks will be taunting the hulks to keep them away from the group. Healers will be using Breath of Life and the Barrier ultimate as needed. Right at the beginning you will encounter some trash mobs which are pretty easy to kill, just make sure not to stand in the charge attack of the Kagouti, it will oneshot if you do not block. On top of the hill you will have the first real trashpack encounter. The dead Centurion in the middle will revive some Spheres, there is a total of 2 waves. Make sure to interrupt the Spheres when they are charging up their attack, if they are not interrupted fast enough the group will take a lot of damage. After that you can walk down the hill again and you will encounter some more Kagoutis and Spheres and then you are already on the first boss. There is some very specific mechanics that you need to know to beat this boss. And there is also quite a few ways to actually kill it. Each tank has to tank one of the bosses. Now the most important thing is, they can not be connected for too long. If you have them connected for over 10 seconds their damage will scale higher and higher and eventually oneshot people. You need quite a lot of people with the Purge skill, as you can cleanse a lot of the enemie’s DoT from you! We basically have each boss on a side, so left and right side with each 6 players (4 DPS, 1 Healer, 1 Tank). Tanks then need to coordinate their bosses so when a sphere spawns, then you can break the shield of the sphere and one of the groups can kill the sphere. If you keep killing the Spheres you will not get any enrage phase. Just make sure to be careful when the adds spawn, those little mobs can hurt quite a lot, but they can be rooted with Talons for example. DPS and Healers need to make sure to not stand between the two bosses, as they shoot sparkles over to the other group. Plus if the beam hits you, then you are pretty much dead. This is a pretty basic but the most dangerous mechanic. If the bosses are connected for a certain time, they will oneshot almost everything. So make sure to never have them connected for over 10 seconds. Players can also not stand in the beam as it basically hits you for 10k per second so it will pretty much oneshot you. So make sure never to stand between both bosses, because sometimes the boss moves a bit around and might get connected for a split second and then the beam is going to hurt. The Boss will place a shockfield under the tank, it deals an insane amount of damage, so nor the tank and the group can touch it. It is pretty easy to avoid as it is stationary. This is the most dangerous mechanic for the group as it deals quite a lot of damage, it is random and it stuns everyone that gets hit. The boss will weave his tail and sparkles will come out, they are slow moving balls that will stun everyone that is being hit. You can reduce the damage of the sparkles if you block it, you will also avoid getting stunned this way. It will also leave a DoT on you that deals a small amount of damage, it is purge-able. The Boss puts a nasty bleed & heal debuff on the tank, you have to make sure that your healers apply enough heals to heal through or purge it. From time to time the Boss will knock the tank on the ground and someone else has to interrupt the Boss, otherwise the tank will die after like 3-5 seconds. You can block this mechanic when you know the animation of the attack. The Spheres that will spawn after some time are the groups biggest enemy, as they are constantly applying poison DoT on the players. The Poison DoT has an instant direct damage hit and then applies a DoT on you. The Poison DoT can be cleansed, so I recommend at least 3-5 Players in the group that slot Purge and use it every few seconds as there will be a lot of Poison DoT! In Addition to that, they also have a Snipe attack which oneshots most players, it is dodge-able and interrupt-able. Make sure to have 2 DPS assigned to interrupt the Spheres Snipe attack with Crushing Shock. Once 8 Spheres spawned, they will automatically enrage. Once they enraged their Snipe will charge faster, which means your DPS have to be faster with interrupting. From time to time firebugs spawn, make sure to pull them to the group and AoE them down as fast as possible, I also recommend blocking for the time being as they deal quite some damage. Once one of the bosses is dead, the Spheres will enrage and it is very important that one of the Healers or DPS keeps using Purge every 2 seconds as the Poison DoT will deal immensely more damage. The second boss fight starts almost after the first one is dead. You have to kill some trash mobs and then the second boss is going to spawn in the middle of the room. This is one of the more challenging bosses in this trial, it will take time to get used to the mechanics. Spread out around the boss, avoid unnecessary damage. As soon as the add spawns it will be tanked near the boss, DPS still focus on the boss and the Centurion will die from the AoE. If not enough AoE DPS then make sure to have your ultimates ready when the add spawns or focus it down. 30 seconds into the fight the NPC will shout to go upstairs. 4 DPS with shield and self-heal use the portals on the edge and teleport up, so make sure you assign a DPS to each platform before you start the fight. Players left downstairs damage the boss and kill the Centurions and Conduits. Damage on tank, spawns sparkles around the boss that stun, you can block the stun. Amount of damage the sparkles deal is not that big if you block them. Streaks to a random person, leaves a big, heavy hitting Liquid Lightning on the ground. Do not stand in there for more than 1 second, otherwise you are going to get instantly grilled. Swings his staff in a huge cone AOE, if you do not block it you will get knocked back and get a lot of damage. Lightning Staff heavy attack on multiple targets, deals damage and drains magicka. The last tick stuns the 4 players and deals damage. From time to time Shock Meteors will fall down from the ceiling. They are easy avoidable. They do true damage, so you can not shield through the damage, if 3 of those hit you, you are going to die, no matter how much health you have as they deal damage based on % health. First activates 6 seconds into the fight, then one more every 60 seconds. Doesn’t die, just deactivates. Steam every 30 seconds, the steam deals an insane amount of damage so make sure to stay out of range while he does this. If you get hit by the steam you also get a healing debuff which can stack up to 10 times, which causes you to basically get zero healing received, especially the tank has to be careful. The Centurion also does a Heavy Attack which hurts a lot. So tank has to make sure to have enough health to be able to block it. When no one is in close proximity of the Centurion, the add will start spinning around and deal damage, if someone gets close the add will stop doing it. Every 40-45 seconds Boss disappears and gets replaced by 4 shades standing around the tank. Tank is not allowed to move, stands on a small green area. One after the other one Shade gets active (look out for the animation), and uses a shockwave on the tank. The tank has to block and *face* the shockwave, otherwise he gets a stacking bleed and the shockwave itself will kill everyone in its range. Spawns randomly over the arena. Two DPS have to focus it so it dies as fast as possible. Activates every 30 seconds, “decharges” himself and dies eventually. Lightning Spin which is a Heavy hitting AoE spin. A DPS can slot taunt and kite this centruion around the edge of the arena and it will eventually die as it basically kills himself. Or the off-tank can take the Charged Re-fabricated Centurion and the main-tank can take the boss + the normal centurion. Mechanic happens every 90 seconds. 60 Seconds time to kill all 4 Spheres upstairs and activate the buttons. All buttons have to be pressed at the same time, if you fail to do so everyone will die after 60 seconds. The Platform have shockfields, so make sure to have a Shield when you go up. Make sure 1 DPS also has Elemental Drain, to debuff the Spheres with Major Breach so they die faster. The first person to go up will get the beam to deactivate the shield of the sphere. You need to walk the Beam through the Sphere so it deactivates the shield. Be careful, it also deals damage to your friends. All 4 DPS focus on the same sphere and then move on and kill all of them. Once they are all killed, go back to your original position (North, South, East, West) and one person calls out “PRESS NOW” and everyone presses the button. Then you can leave through the portal that brought you up to get back down. After the second Boss is killed, you have to use the teleporter into the next area. Now, if you wan to play it safe go with the full group to the right side and kill all the Spiders. Once you reach the boss you turn around and go to the other way till you end up on the boss again. Or, you can send one of your tanks to the right side so he can pull all the spiders with him and you meet up on the left side, one person will not aggro the Boss. You can run past him and he will just wait there if you are fast enough and all the Spiders will still follow you. The rest of the group goes to the left side and pulls all the Spiders to a position where you can safely kill them with the others from the off-tank. After those Spiders are dead the next boss fight is already waiting. This boss fight is a bit special. You can only damage the boss during the “stun phase”. As long as the boss has his shield up you will not be able to damage him at all. You need to press the button on the right side to activate a “shockline” so he walks through it and the boss will get stunned for approx. 15 seconds. During that stun phase you need to dish out as much damage as possible. Make sure to always stand behind the line, if you are too far ahead the shockline will drain your magicka. Once the boss is back up two adds will spawn, which you need to bring to your next stun postion so you can kill them there quickly. Here it is very important, that you place your DoT already on the boss before he gets stunned, to get maximized damage. As long as the boss is not stunned, you can not damage him. If you walk into the shield you will die. If adds get too close to the bosses shield, they will get a shield on themselves and will be harder to kill. Every time you press that button to activate the stun phase, the boss will move faster to the next platform. Make sure to activate the button early enough, you do not want to miss the stun phase. Place all your DoT and ground based DoT on the boss already, so you can go full out on damage when the boss gets stunned. Every time you move to a new stun area, make sure to bring the spawning adds along so you can kill them there. Make sure not to forget to debuff the boss for each stun phase. Every time after the boss recovered from the stun, two adds will spawn. Its either a Two hander or a Dual wield add. Make sure not to get damaged by the adds, avoid unnecessary damage. We place the adds slightly behind the button, if the adds are far away when the boss gets stunned, they will NOT get a shield, then you can drag them into the boss and melt the rest of their health down with all the AoEs and Ultimates that you drop on the boss. Make sure to damage them as much as possible before the boss arrives at the stun phase. Blades deal quite some damage and put a bleed on you, so you have to make sure that there are always heals or people use shields. Always stack on the fast spinning blades. Because it takes less time for the blades to get through so you will take less damage for that short amount of time. If you are too far away from the boss, the boss will shoot shock darts at you and you will most likely die pretty fast. Once you figure out how to coordinate the adds with the boss and nuke them down, you should have no problems killing the boss. Just remember, every time you press the button, the boss will move faster to the next stun phase. You will have to go through a hallway with blades and some adds. Now there is a new type of add called a Capacitor. He has an AoE attack that will be placed on a person and then it slowly grows and explodes. If you do not block it you will get stunned and it starts draining magicka. So make sure to learn the animation of that attack. After that hallway you will find yourself in the junkyard. You have to kill the big blue Centurion. Once he is close to his death he will revive the spheres around him. Make sure to send a DPS to each of the spheres to interrupt them with their shock charge attack. After those are dead, repeat the same thing with the next Centurion and a few of the adds. Once those are dead the big door to the fourth boss will open up. This is the most difficult boss fight in the whole trial. It requires a high amount of coordination from tanks and then group. The tanks will be busy with the two Two Hander bosses. Split into two groups so they can both DPS the Reducer and the Reactor. At 69%, 39% and 19% you have to bring all bosses to the reclaimer in the middle to stun them. When the bosses hits those percentage numbers, they will get overcharged. When they are overcharged they are in an “enraged” mode and almost oneshot everything. Make sure to drop all bosses to about 3% away from those numbers (so for example 72%), then bring them together and drop them to 69% so they all get stunned. They only get stunned when they are close enough together. Once they were stunned, take them apart again and start from scratch and repeat this till the last stunphase at 19%. I recommend tanking them in some sort of a triangle. Make sure that they can not get connected, if they get connected they will deal way more damage then usual and almost oneshot everything. It will show you a huge shock beam between the boss, so you know they are connected. This is the boss in the middle, he never moves from his position. He will spawn a shield around him which will almost oneshot everything that touches it. After a while the Reclaimer will start spawning “Bombers”, they will spawn somewhere on the outside and slowly walk towards the Reclaimer. Once they reach him they will charge up and run towards a random target and blow them up. You can shield up so you will not die, as long as they are not empowered. Immediately focus the bombers once they are spawned, so you can kill them before they attack someone. Make sure to place all AoE around the reclaimer, so the bombers die pretty quickly. Save always 2 Destro Ultimates for this phase, so the bombers will definitely die. Also make sure to place Elemental Drain on the bombers. They will get more damage and your magicka setups will not run out of magicka that fast. If you block the explosion, you will only get knocked down, instead of being knocked back. After a while, the boss will also start placing the “Drain Shock” ground based DoT on your players which will slowly explode and stun people that get hit by it. You can block it, if you do not block it and you get stunned, it will drain your magicka. The Reducer has a powerful fire AoE attack, which shoots 3 fireballs away from him. Make sure your healers have purge ready to cleanse the Fire DoT as fast as possible. The Heavy attack from this boss is very strong, so the tank has to make sure to either dodgeroll or block it. The Reactor slams his sword into the ground and unleashes some sort of AoE towards someone and at some point it will stop and turn into “fingers”. If people stand in those they will get sucked down and take a lot of damage, so make sure to avoid those. The tanks have to swap the bosses from time to time. After a while, bubbles will come out of the Reactor and Reducer, this means that the tanks have to swap the bosses with each other. If you take all 10 bubbles from the same boss, you will die, no matter what. As soon as the bubbles start you can cross taunt the bosses and go on with your usual business. Try to keep the bosses as steady as possible so they do not move a lot. If they move too much you will loose damage and they might get connected which results in a lot of unnecessary damage. Once one of the bosses drops below 25%, the burnphase begins. Drop all bosses to 27% first and then start dropping them all to 22% and then bring them together. Static Bombers will start spawning on the outside and explode. After a while they will spawn closer and close to the middle. At some point there is basically no room to move around. Make sure to find a “sweet spot” where no bombers explode during the execute phase, there are some very small spots where they do not overlap and you should be save. Now here is where it gets very tricky. Bombers are spawning from the outside, so you do not have a lot of time. Bring all the bosses together when they are around 22% so they get stunned at 19%. Do that right after the Reclaimer Bomber phase ended. Once they are stunned, make sure to only single target the Reclaimer. The Reclaimer is the first boss that needs to die. If he manages to keep spawning Bombers, they will most likely blow you up. So make sure to save some Destro Ultimates for those! The two Tanks have to bring the other two bosses away from the middle to a safe spot. Very important here is that they can not drop below 15%. Once they drop below 15% they will connect the shock beam to each other and overcharge and most likely oneshot your tanks. After the Reclaimer is dead, you can bring in one of the two bosses and kill them one by one. If you manage to kill this boss, you will have a happy time on the next one. After the fourth boss is dead, you will have to fight with some more adds in some long hallways. They are not really a big danger, just make sure to focus the Megaman add first. You will also find some electrified water, which will drain your magicka if you stand in it, so make sure to avoid it. The last boss is easier then the fourth one. Once you figured out the positioning you will not receive a lot of incoming damage. The boss himself is not really the biggest threat here, the adds are more dangerous. Every now and then he raises his left foot and stomps it on the ground, everyone in melee range has to block, otherwise you will get knocked back. The Stomp also deals some damage if you do not block it. Not a lot, but if you combine it with other incoming damage it can kill you. The right foot spawns fingers, so make sure not to get stuck in them, like on fourth boss. The boss will keep spawning Meteors on players which deal an fair amount of damage, that is why it is important not to overlap too much. You can see Poison behind the boss, you can not stand there otherwise you will almost instantly die. You can find Shock nodes upstairs, they deal quite a lot of damage so make sure to avoid those if you are upstairs. A magicka setup has to stand on the right side of the room. If no one stands up there the fire will hit the group. If someone is up there the fire will only hit this person. You can stand on the edge of the corner and not receive any fire damage at all, otherwise make sure to keep your shield up. Place the off Tank on that side so he can take care of the blade. If no one stands up on the left side the blade will hit the group and almost immediately kill everyone in seconds. At 85%, 65% and 45% the boss will move to the middle after he lost both of his arms due to damage. He will repair his arms there. Once he lost both of his arms, make sure everyone moves away from the top, because sparkle shock damage will go there and might kill people close to the boss. During that phase, on each side a sphere will spawn. Do not damage the boss during the recharge phase, he gets a huge shield and if you damage him he will shoot shock flares at you which deal an insane amount of damage. During the recharge phase you have to kill at least two spheres, otherwise the boss will oneshot you. The more spheres you kill, the less damage you take from that boss burst damage. Now here is also very important, you need to stand in the middle of the lines of the room. If you move too far to the side the poison that spawns during this phase will almost instantly kill you. At 90% & 87% / 70% & 67% / 50% & 47% adds will spawn. For example, at 90% you get a Megaman and a Two Hander add. And at 87% you get another Megaman and a Two Hander add. You can either nuke them down together with the boss, or kill them separately. Keep in mind, if you take too long to kill those adds from for example 87%, a timer will start and spawn more of them if you take too long. Timer does only begin at x7%. Tanks position the adds next to where the sphere will spawn so we can drop all our ultimates on them and they die fast. Takes a bit of time to learn how to get the adds to stack there. Main tank usually taunts the Two Handers, while the Off tank tries to position the Megamans. Megamen have their Draining Shock again, so make sure to block that otherwise it will drain your magicka and you get stunned. If people die, it can be that Facsimiles spawn. Those are copies of your characters setup. The most dangerous one is the Magicka Sorc Facsimile, their mines almost oneshot players so be very careful. The Main tank should taunt the Facsimiles so they will die in AoE. at 30% and 27% you will again get the add spawns. The boss will go into the middle and start spawning meteors on the players. So you have to make sure to have a good placement for the execute phase in the middle of the room. If people overlap meteors you will die. With this positioning that you see on the picture, you should not overlap meteors. The healers have to make sure that they hit the players in the corners with healing springs. There are no new extra mechanics. 2 Healers, 1 Maintank, 1 Offtank and 8 Damage Dealers. Most important thing is, that a few of the DPS run Crushing Shock to interrupt certain mechanics of the Poison Boss. Healers also should run Purge to cleanse a few enemy DoT, this is very important. For magicka setups make sure to run Harness Magicka and for stamina setups make sure to run Deadly Cloak (For Dualwield). It’s recommended to have Major Resolve and Major Ward on your characters at all times, most classes have access to them and they provide about a 10% extra damage mitigation. Running at least 1 Magicka Templar Damage Dealer with Kagrenac’s Hope set will make res-ing allies a lot easier. Make sure to kill the adds in a fairly short time, they do not have a lot of health and can be stacked next to the main boss. If you do not kill them fast enough they will enrage and eventually oneshot everyone. The Main boss has two dangerous attacks, Defiling Blast where he targets one player that will slightly glow green. That person has to make sure to stand still so the other players can move out of the green conal area. People that do stand in the conal area have to block the pulses otherwise you will get oneshot. So make sure to block first and then run or dodge roll out. The second dangerous mechanic is the Oppressive Bolts where the boss will charge up for one second and glow green. Then shooting poison balls to all group members, this mechanic can and must be interrupted by either the tank or someone else. Boss channels for a second & his whole character glows green. Raises his weapon straight up & rains down Bolts onto all group members. Boss channels for a second. Releases a Bolt which Targets only the Player/Tank currently with aggro. Enrage: The Attendants Enrage 30-35 seconds after spawning. Early Death: The Attendants die/sit down at 12-20% of their HP. A single laser beam that targets the Player/Tank currently with aggro. Two players have to be placed outside the group, one on the left and one on the right side to “catch” the Teleport Strike attack from the boss which will leave a huge red AoE on the ground. He always jumps to the furthest person away. That AoE also leaves Maim debuff on players, which results in them dealing less damage. Manifest Wrath has to be avoided, stack close to the boss and when he does this attack, spread out a bit and once it exploded go back close in to the boss. The adds have to be killed fast, otherwise they will enrage so make sure to save your Ultimates for when they spawn. When Felms reaches 25% health or lower the adds will enrage faster, which means you really need to make sure to kill them fast. 1 AOE is dropped at first. From 75% the Boss will start dropping 2 Storms and at 50% 3 Storms each time. Interval between Shrapnel Storm is every 25-30 seconds. If you are exposed to Shrapnel Storm, you will also get a Bleeding DoT on you which deals damage. You can cleanse this debuff. Boss holds his hand up and shoots two red AoEs on the ground where 3 small sized AoEs will pop out of and go in a certain direction and damage everyone in its way. If you stand in the middle of this AoE you will get hit by all 3 and die. You can block this to reduce the incoming damage. Whirlwind/Steel Tornado. Does around 8k normally, goes up to 40k damage when they’re enraged. 1 Player is targeted. Usually the furthest away are targeted. They are pulled/chained into melee range. Make sure to tank the boss towards the right side of the map, like you can see in the picture here. One of the healers or a damage dealer also has to stand in front of the boss, like you can see in the picture. This needs to be like that so the person can kite the shock fields that will otherwise land on the main tank. At 90%, 75%, 50% and 25% the boss will jump to the left side, right side a few times, at the entrance or exit are save spots so you can simply go there. After that the boss will most likely use Storm of the Heavens, you need to be spread out and avoid those AoE’s. If you get hit by two or more you are instantly pulverized. So it is very important that people do not run over each other, otherwise this might cause a lot of deaths. Spheres will spawn from time to time, if a sphere is connected to the boss, then the boss is damage immune which means you need to focus down the spheres as fast as possible. The only very difficult mechanic once you reach 25% is the huge Fire AoE called “Trial by Fire” there will be 3 spots where huge fire AoEs will land at three places in the room. You need to make sure that everyone is in purge range to immediately purge the enemy DoT from you. People have to use Harness Magicka to not instantly die because it hits for a lot of damage. As mention in the beginning, it’s recommended that one Magicka Templar DPS or a Healer is using Kagrenac’s Hope so people can be resurrected faster and prevent a wipe. 5 waves of Charges are thrown during Storm the Heavens. In Hardmode the positioning is very important. Make sure each DPS has an assigned position. So he knows exactly where he can run when the shock AoE falls to the ground. The healers still have to kite the Dual wield Maim fields and Healer 2 also has to take care of the Shock field AoE behind the main tank, place them as close as possible to the wall. The Bosses you can add to the Main Boss are Shadow copies of 3 Members of an Order of Gryffin Riders called “The Welkynars”. Each one of the mini bosses represents a specific element (Fire, Ice, Lightning) and their magic is based off this element. The Boss for the Element of Fire is Siroria, wielding a Sword and Shield he uses the standard abilities of a Magicka Dragonknight such as Flame Whip and Burning Talons. Once you enter you will see 3 Crystals around the room they die relatively quick. Once they are destroyed a spear of light is gonna spawn in the Boss Room room. Your group members need to synergize these spears to send them to you into the shadowrealm. From the 3 crystals you destroy 3 orbs will spawn while the orbs are in the room they deal damage to players in form of dark projectiles. Once picked up the carrying player will receive a lot of damage so be quick to deliver. To deliver simply run into the spear of light with an orb on you. Repeat this process for all the orbs in order to close the portal. You can now proceed to bring down the miniboss. After a while the portal will open again. The players that went in there the first time will not be able to go inside again, so form 2 groups that can rotate. After the 2nd group has closed the portal you can send the 1st group in again, rinse and repeat until the Mini Boss and his partner are dead. His Jump ability which he will do once he falls below 50% of his HP. He will leap into the air smashing the ground where he lands, sending out little flame tornados in all directions that deal a lot of damage. The Mini Boss and his familiar empower each other once they are close together so keep them apart. The Gryffin will take flight at multiple points of the fight, flying over the stage leaving vicious whirlwinds where he flies. Watch out as these stun you once you touch them and put a DoT effect on the player. Once either Siroria or his Gryffin familiar die, an enrage mechanic is triggered summoning Creepers (Big Vines that bind players and force them to dodge roll out of their grasp in order to survive). Try bring the bosses to about 10% HP then kill the Gryffin first as he has more HP, then kill the rider. The Boss for the Element of lightning is Relequen, wielding a staff he uses like a martial artist his signature attack is a heavy attack which sends out lightning sparks into all directions stunning every player hit. His partner the Gryffon Belanaril is casting his characteristic ability which overloads your current weapon forcing you to swap to your other bar and remain there for at least 10 seconds. Should you swap to your overloaded bar, you will damage yourself and your allies heavily. Once either Relequen or his Gryffin familiar die, an enrage mechanic is triggered summoning Creepers (Big Vines that bind players and force them to dodge roll out of their grasp in order to survive). Try bring the bosses to about 10% HP then kill the Gryffin first (as he has more HP) then kill the rider. The Boss for the element of lightning is Galenwe, wielding a two handed Sword he is casting a ring of ice around the tank that has aggro of him which deals a lot of damage if you stand on the ring. His partner the Gryffin Falarielle casts his characteristic ability which is a hoarfrost whirlwind which gets cast onto a player this effect will deal damage over time and slow the player affected by it. After a while this player can use his Synergy Key to drop the Hoarfrost for another player to pick it up. If you do not pick it up, it will start shooting damaging projectiles at random players increasing in strength every second it is not picked up. After 3 players have had the hoarfrost on them and dropped it the ice will vanish and Falarielle will cast it on another player after a short delay. Once below 50% Galenwe will cast an ability which summons 3 huge telegraphs around 3 players which indicate an ice explosion. It will kill players who stand where the circles overlap. Each encounter features a Gryffin and his rider. In all 3 fights the players have to best the same Shadowrealm portal mechanic and each boss’ characteristic unique ability. All Gryffins take flight and leave stunning whirlwinds on the ground. All Bosses possess abilities where they jump/teleport across the room. Once Gryffon and Rider are close to one another they empower each other. The Gryffins have way more HP than the MiniBoss, so target them more than the MiniBoss. Side note for tanks: The Gryffins light attacks apply a heavy bleed on you. Z’Maja is a sload. She uses dark magic and deals magic damage. Her normal attack is called ‘mind blast’ and it attacks everyone in front of her. Her heavy attack is a big ball of darkness which deals heavy damage. Another one of her attacks is crushing darkness. It locks onto the tank that keeps aggro of her and the person furthest away from her (beware it doesn’t always target the furthest person 80% chance). The probably deadliest part about this fight is the orb mechanic. 3 orbs spawn around the room if not killed in short time they can stun the group members and deal heavy Damage over Time. From 40% of Z’Maja’s HP down there will be nocturnal creepers spawning around the room binding players forcing them to roll dodge (and kill you if you don’t have enough stamina). Also Z’Maja opens a Shadow Portal in the middle of the arena. However this portal is different to the previous ones. You will find an exact copy of Z’Maja inside the portal so it is required to bring a tank downstairs. The biggest difference is the number of crystals in the room, 3 orbs hide inside the 6 crystals. Only a crystal which drops an orb will spawn a spear synergy in the main boss room. Delivering works in the same manner as before. Once this process has been repeated for all 3 orbs you will be sent back into the boss room. After about 20 seconds in Z’Maja’s shadow world she will cast an explosion expanding from the middle of the room. To avoid the explosion you must make it to a synergy close to the 4 platforms in the corners of the room, sending you upstairs to save you from death. As soon as 3 orbs have been delivered, the portal closed and you have been sent back into the main Boss room a Big Spider (Yaghra Monstrosity 2,1Mil. HP) will spawn which needs to be focused. After z’Maja has reached 5% of her HP she will teleport to the top end of the room summoning her shade from the shadowrealm. You have to kill the shade in order to defeat z’Maja. After about 20 seconds players will receive a debuff called baneful mark. It puts your Health on 20% of your maximum HP and applies a growing DoT such as a heavy healing debuff (85% last week of pts). In order to get rid of baneful mark you must heal up to 100%. Baneful mark gets applied to you every 20 seconds. Z’Maja’s shadow possesses the same abilities like the original and you will have creepers spawn during the fight. Once the shade is defeated you have bested Z’Maja.